I use high-quality archival paper and a variety of leads to create pet portraits that are timeless, beautiful pieces of art. My dog and cat drawings are executed with the level of detail needed to capture your pet’s likeness and convey their unique personality. First, send me a message describing what you would like me to draw. You can contact me by email, phone, or by filling out the form on the "Contact" page. Tell me all about your pet, along with any other relevant details. 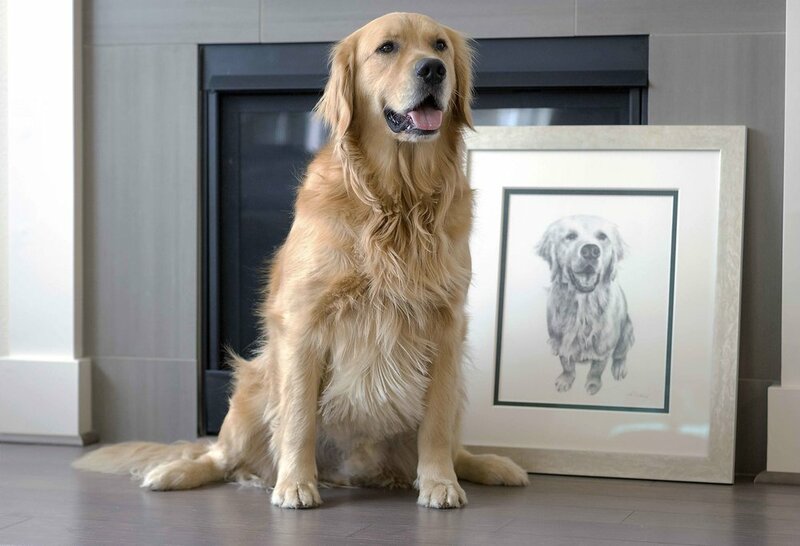 Do you have a vision for your pet portrait? Will it be a gift? Do you have a size in mind? A specific deadline? Email me your photo(s). If you’re unsure which image would work best, send a bunch. High quality photos result in better pet portraits. Select an image that shows off your pet’s personality! If you send multiple images, I can help you judge which photo will result in the best pet portrait. Are your images too large for email? Just let me know and I'll provide a dropbox link. After I receive your images, I'll reply, and we’ll discuss the details: image selection, size, price, turnaround time, etc. After we have ironed out the details, I provide an invoice so you can submit a $25 deposit via PayPal. Once payment has been confirmed, you will receive a message from me confirming your pet portrait order along with the delivery date. I’ll update you as I work on the drawing and send you a digital proof once I finish. After you approve the proof, I will invoice you for the final amount. Once payment has been received, I'll ship you the final drawing. You sit back and wait for my gorgeous drawing of your dog, cat, parrot, guinea pig, etc. to arrive. It’s that easy! For tips on taking a great photo, read my blog post: 10 Tips for Photographing Your Pet. Each additional pet is $50. Prices for custom sizes will be provided upon request. All pet portraits require a $25 deposit to begin work. Remainder due upon approval of final proof. While I focus on dog drawings and cat drawings, I really just love to draw. Babies, pets with kids, pets with grandma, houses, cars, garden gnomes – you name it. If you have an idea for a drawing not listed here, please contact me and I will provide a quote. I take pride in my work, and I want all my customers to be 100% satisfied. If you are not happy with the digital proof, I will address any specific concerns and feedback, and edit the drawing accordingly. If you are not satisfied with the final pet portrait, you may return it to me within 10 days of receipt for a full refund. Note: You are purchasing the final piece of art. Pup Doodles retains the copyright.